Finance Matters is the Lab’s newest programme of work, led by myself, Lydia Hascott – supporting finance professionals who are committed to changing finance from within mainstream institutions. This blog is the first of many, sharing how we’re approaching this work. What is the purpose of finance? As we’ve argued in The Regulatory Compass, finance serves a number of immediate purposes: creating and channelling money, safeguarding assets, facilitating transactions, and sharing risk. But these things are not the ultimate purpose of finance. We need to step back and again ask ‘why’? What purpose do these functions serve? In our view, the ultimate purpose of finance is to enable society to sustainably function by helping us meet our individual and collective goals. In other words, finance ultimately serves a societal purpose – or it should. But we see many signs that finance is ‘societally un-useful’, from misallocation of credit and fossil fuel funding to financial exclusion and the housing bubble. These challenges present opportunities for intrapreneurs within financial institutions to innovate in ways that bring finance into alignment with its ultimate purpose. Intrapreneurship is a hard path to tread. Finance is a complex system – an interconnected set of vast numbers of elements that interact in highly interdependent and non-linear ways. Changing complex systems isn’t as simple as fixing a car that breaks down: it requires the ability to observe patterns and collaborate with others, as no single actor has a complete bird’s eye view. Systems change also requires experimenting with initiatives, learning from what happens, then iterating and experimenting again. This is why we’ve built Finance Matters, to support the changemakers choosing this difficult, but much needed journey. What is the role of innovation? The term ‘innovation’ is used so much that it’s hard to know what we mean by it. More than new technology or disruptive business models, at the Lab we seek to support innovation that creates changes in the financial system aligning it with its ultimate purpose of enabling people and planet to thrive. This type of innovation can take two forms, one more transformational than the other. The term ‘social innovation’ is often used to describe initiatives that generate social and/or environmental outcomes. 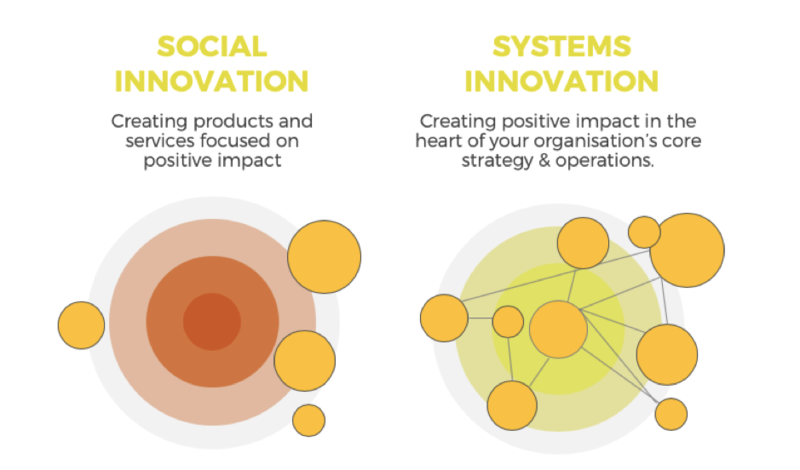 But the problem is that social innovation often focuses on isolated products or services that occur in pockets of an organisation (likely a CSR team or social innovation unit) and have little effect on core business strategy and operations. Too often social innovation addresses the symptoms of a broken system, rather than root causes. Icebergs have a small, visible portion above water, with 90% of their mass lying unseen beneath the surface. In the same way, underlying financial products and services are a range of factors which shape them and the impact they have on the world. Policy & regulation – the structures that shape the rules and parameters the system operates by. These things are not products and services themselves, but are the things that shape how a product is designed, distributed and commercialised. These things also shape how products are not designed or who they are not designed for. Power dynamics: Who gets to make decisions and have a say in how finance works, and who doesn’t. Innovation projects can start at any of these three levels, but ultimately must always take the whole iceberg into account. 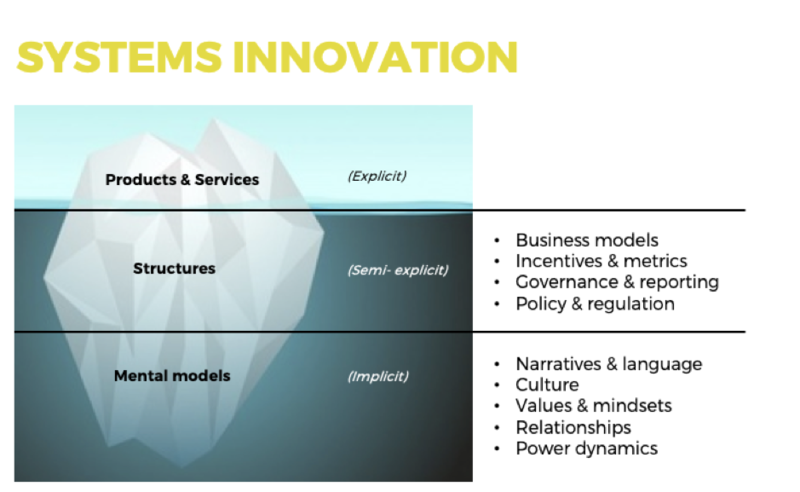 Below are three examples of systemic innovation at each level of the iceberg. All are real examples from the Finance Matters Intrapreneur Community. Product / service: A current account with a subscription model, rather than a business model based on collecting overdraft fees from those in financial hardship. 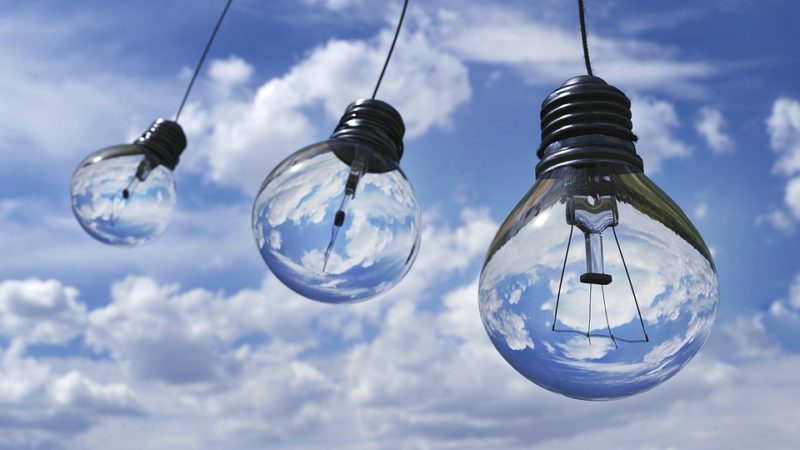 Innovation is required not just at the product development level, but requires a different business model, adapting to regulation and for a shift in mindsets around how current accounts can and should create and share value with customers. Structures: A bank experimenting with bonuses and KPI’s that are 50% based on performance and 50% on employee behaviours such as collaborating internally and acting in customers’ long-term interests. Mental models: Humans in Finance, a platform co-founded by three finance professionals designed to share the stories of colleagues creating positive change in the world. Platforms like this have the potential to shift both public and industry narratives about the purpose of finance and the role of finance professionals in realising it. What we’re learning from the intrapreneurs we support is that the biggest challenges and the biggest opportunities lie in the human aspects of their work. Influencing the right people, changing mindsets and building a network of support are critical to a purpose-driven project’s likelihood of success. This is why Finance Matters is building an Intrapreneur Community for finance professionals working on projects aimed at making their organisations better serve people and planet. We support these intrapreneurs through peer coaching, workshops and training, leadership development programmes, and networking opportunities. If you’re working to change your organisation from the inside and you’d value a community of support, apply to join the Intrapreneur Community here.